My love of music began for me when I was around the age of 11 or 12 back in the early 70’s. It was at this time I had the privilege of hearing two albums that both happened to have songs on them that were over twenty minutes each and I fell in love with both of them. I would listen to one or the other every night to go to sleep with while wearing those nice big and bulky old fashioned head phones (yes I learned how to get positioned right so that I could go to sleep). The first one is where my passion for Pink Floyd’s music came from with their 6th studio album Meddle and the 23 minute plus masterpiece Echoes. The second one was Emerson Lake & Palmer’s second album, but really their third (long story not told here) “Tarkus” and the title track with the same name. To give you an idea about what I thought about the album “Tarkus” I even did a school assignment on the album in the 6th grade. 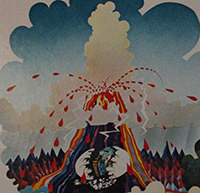 I still have the record and here is a picture showing were I cut out Tarkus for the paper. It was simple to do an assignment about war using the album detailing all of Tarkus’s battle victory’s. All of this thoughts came back to me in spades on March 11th when I heard the news that Keith Emerson had passed away. As we learned later he took his own life that night due to possible depression issues arising from the fact that he had nerve damage that hampered his playing. Keith’s ability to take classic composition’s and add his own music style to it forever changed music. He was one of the first musicians if not the first to master the Moog Synthesizer and fluently incorporating it in with the piano, organ and other key type instruments of destruction then you add in the vocals, song writing and guitar (bass, lead and acoustic) playing of Greg Lake and one of the greatest drummers ever Carl Palmer ELP helped put Progressive Rock solidly on every radio station in the world. Although there are other albums or songs that showcase more of Keith’s skills I have chosen my favorite ELP song “Tarkus” to use as my in memory of post. “Tarkus” comes in seven parts. First we have the hard rocking two minute 43 second “Eruption”. As you listen to it you can get the feeling of what it must be liked to be born from an egg in the middle of a volcano. Keith ability to go from one instrument to the other is amazing. You get a sample taste of just about every instrument he plays while flawlessly moving from one to the other. Then you add in Palmer’s drumming that doesn’t at any part try to over power the song put keep it all moving and in the end the gun tooting steel Armadillo type creature is born. We progress into “Stone of Years” which was co-written by Greg Lake and Keith Emerson. To me it gives us a little background of Tarkus growing up and we get Lake asking our cannon blasting hero many questions that a parent might be asking there “know it all” teenager. Keith pretty much stays with the organ on this tune and about the half way point goes off on a very controlled rampage that brings life into the subtle song. “The preacher said a prayer. Save every single hair on his head. This is my favorite part of the song. The lyrics during the three minute part seem like sections of the battle where the bug creature is begging for his live before our hero destroys him. The song takes in a life of it’s own. When Greg does the singing parts it’s almost like Tarkus is in a holding pattern awaiting for his enemy to attack then as the singing parts come to an end Emerson kicks in with some of his multi-instrumental playing. With his playing style you can tell how each attack our hero is making is going. In the beginning the attacks are some what slower and more precise buts towards the end of the battle Tarkus pounds the victim with everything that he has. You know when “Mass” ends and we are coming up on Tarkus’s greatest battle right around the 11 minute mark. “Manticore” is on his way and just by the sound of some of Emerson’s short barrage’s on the organ, Palmer’s drums and Lake’s intense guitar play for the one minute plus that it takes the “Manticore” to get in front of our hero you can tell that he is a beast no one whats to fight. 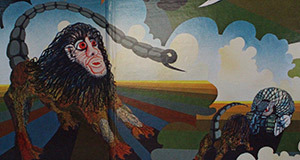 The way that the band adds in some mellower breaks in the song you can vision the arrogance that the Lion/Scorpion creature possesses. “Battlefield” is the 4 minute battle between our hero and the “Manticore”. This the 6th part of the tune and was written by Greg Lake. The music style and the lyrics definitely tell us that it’s Greg’s work. Are you deaf when you hear the season’s call? Were you there to watch the earth be scorched? Did you stand beside the spectral torch? Scattered on the ashes of disgrace. The band leaves us with Tarkus’s victory march “AquaTarkus”. A instrumental track written by Keith Emerson. Keith Emerson will be sorely missed by many people but the legend of all of your music wither it’s your solo work, movie soundtracks, The Nice or ELP will live on for ever. No musician proved that a classical music up bringing does not limit you to only classical music more then you did. RIP Keith! This entry was posted in Carl Palmer, Classic Rock, ELP, Emerson Lake & Palmer, Forgotten Rock Classics, Forgotten Songs, Greg Lake, Keith Emerson, Music, Progressive rock, Rock, Tarkus and tagged Carl Palmer, Classic Rock, CS5711, ELP, Forgotten Rock Classics, Forgotten Songs, Greg Lake, Keith Emerson, Music, Rock Music, Song, Tarkus. Bookmark the permalink. 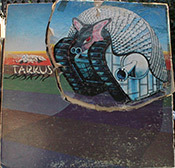 I was young and began to listen to the music from TARKUS . At first I thought it was not music but a nightmare. After a while I realized that this is masterpiece.Still this album is for me the number one in the Progressive rock. I will always remember this wonderful organist. In honor of the memory of and love for these 3 virtuosos I ordered Tarkus model, which will be ready soon ! Sergey you are right about it being the number one progressive rock LP of all time. 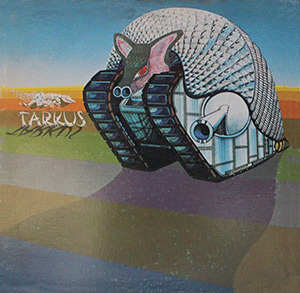 Many might argue with us but the whole Tarkus album side just oozes with everything that is progressive rock! I hope you enjoy your Tarkus model when you get it. I first heard Keith Emerson with the Nice on WNEW FM in New York back in 1969. I saw ELP in 1974 at Roosevelt Stadium, Jersey City, NJ. He was a wild man in the tradition of Jerry Lee Lewis and Little Richard, even though he could play like a combination of Jimmy Smith and J.S. Bach. So sad to hear of his passing. I was lucky to see ELP the first time in 1976 in Denver, CO. The opening band was some band from San Francisco that we had never heard of before called “Journey”. This was before they hired Steve Perry and WOW they blew us away and where the perfect opening band for ELP. Then they got Perry and went top 40 and downhill as far as I’m concerned. I checked out your post a while ago and even left you a comment on it. It was a great post!!! Glad you enjoyed it. Kids now days will never get what true music talent is. With all the junk they listen to that is computer generated they have no concept of how lucky we were when rock music was still raw and experimenting with songs gave us great music like ELP. Maybe someday you could share your experience with us on the Woodstock Festival. We did! 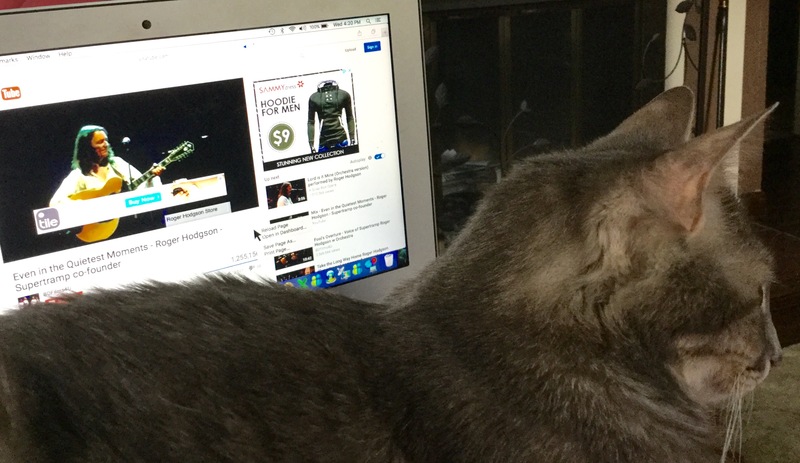 Roxie climbed up on the keyboard to listen. I have a photo but don’t know how to put it into this reply????? Mud, Mud, Mud, Music from a stage very far away (We arrived late because I had to finish work), Mud, overflowing latrines, lots more music and mud. Charley was also at the festival, but he had better seats because he was part of the stage crew! I didn’t know him at the time. Strange world, huh? I will do that. Roxie would love it! There is a plugin called “Comment Image” that will allow users to add images to there comments supposedly. But since I’m using a free theme it won’t let me use plugins. Maybe it’s time to quit being cheap and buy a premium theme. However you can add images to your side bar so I have added Roxie to my sidebar. If you click on image it will open up much larger. Yes, I have a free theme, too and don’t intend to change any time soon. I have enough tech problems as it is. Heading out to learn more about Power Point presentations now. I will check in with you this afternoon. Roxie will love it!